We decided to take advantage of a beautiful day on Sunday to visit a local castle that we hadn't visited yet. We left our house at about 10:30 and arrived at the trail head parking lot at about 11:45. The castle itself sits on the top of a hillside near the town of Neuffen, southeast of Stuttgart. The walk from the parking lot to the castle is uphill and takes about 20-30 minutes, depending on your speed. If you are dragging a 3-year old like us, it takes a little longer. The walk is uphill most of the way, and the last 100 meters or so is very steep on cobblestone. I imagine it would be very slippery if there was rain or snow. We were greeted at the castle’s entrance by a trio of lazy goats. Yep, goats. 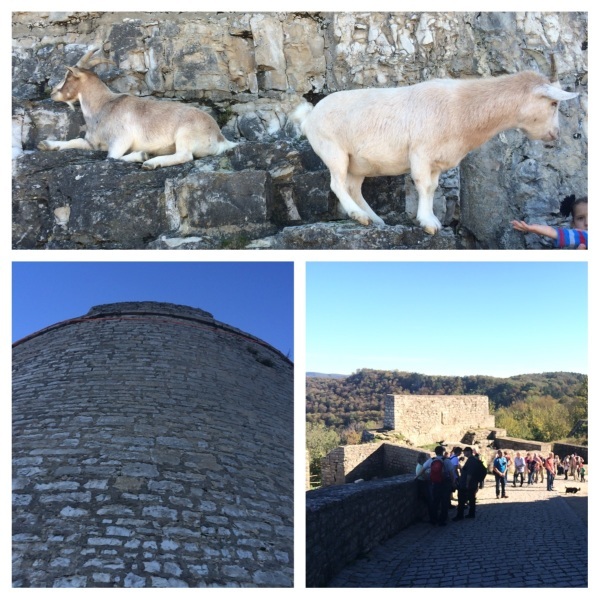 The family of goats lives at the castle and famously lives and walks along the steep rocky walls along its perimeter. Cooper fed one of the goats some grass, and we marched on into the main castle area. Inside the castle, there are a few choices. There is an indoor restaurant, a cafe-style biergarten (order your own food), and a walkway to a lawn-area where you could relax and eat a pre-planned picnic. There was also a staircase that led to another area on the castle high-ground, and that’s where the Falconry Show took place, so we followed the stairs up to the show area. The castle entrance was free, but it cost 3 Euro per person to watch the bird show. Since we had arrived about 40 minutes early, we got seats right up front. The show started at 2pm. Using the English print-out explanation the ticket-takers had given us, we were sort of able to follow the show. 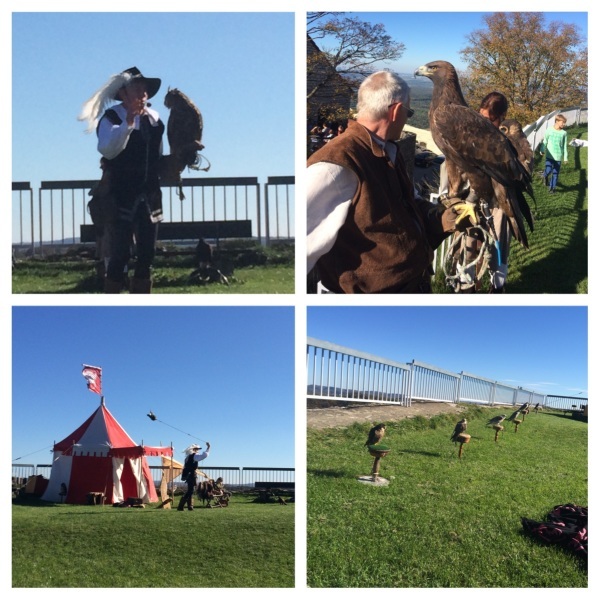 The falconers demonstrated using a bunch of different types of birds of prey, including hawks, falcons, an Eagle, and a few owls. It was pretty cool and Cooper really liked it. When the show was over, we made the trek back down the hill to our van. We drove home without much traffic in about an hour. All said, it was a cool adventure, recommended to others looking for an inexpensive, easy day trip in the Stuttgart area!